When will be The Big Food Rescue next episode air date? Is The Big Food Rescue renewed or cancelled? Where to countdown The Big Food Rescue air dates? Is The Big Food Rescue worth watching? The Big Food Rescue follows a new charity, as they try to make a dent in the 10 million tonnes of food thrown away in the UK every year.Robin Aitken and David Cairns aim to stop edible food going to landfill and instead deliver it to charities and people that are in need. They use a business model that's worked for their organisation in Oxford - but can they make it work in London, a city 55 times the size?The series also showcases inventive schemes from around the country aimed at reducing food waste. 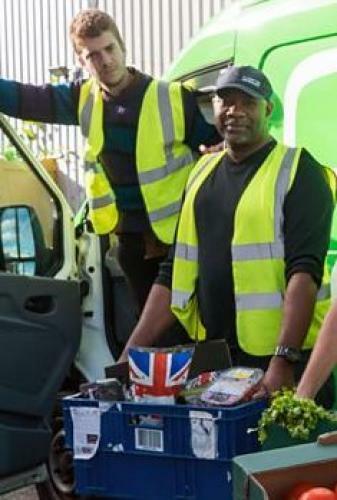 Programme following two men on a mission to change Britain's food habits by rescuing the fresh food that supermarkets used to bin and getting it to the people who need it. The new charity set up by David and Robin to try and change the food habits of Britain is expanding fast, maybe too fast. The project urgently needs to find volunteers to pick up the fresh food supermarkets are throwing away and deliver it to good causes. Making a deal with the Evening Standard newspaper in London gets 600 prospective volunteers phoning up - but will they actually turn up for the hard graft? Programme following two men on a mission to change Britain's food habits by rescuing the fresh food that supermarkets used to bin and getting it to the people who need it. New volunteers are starting at the charity set up by David and Robin, and it is all hands on deck with the amount of edible waste bread they have picked up. Robin heads off to find more charities to sign up, trying to make sure all the fresh food waste goes to good causes. Can they find enough people to eat, and perhaps even drink, their way through the mountain of bread? Programme following two men on a mission to change Britain's food habits by rescuing the fresh food that supermarkets used to bin and getting it to the people who need it. Things are looking up at the charity, but in their depot, a mountain of spaghetti needs shifting. How much pasta can the organisations that the charity deliver to actually take? The charity also needs to find more suppliers so they can provide hungry people with the balanced diet they desperately need. Programme following two men on a mission to change Britain's food habits by rescuing the fresh food that supermarkets used to bin and getting it to the people who need it. Looking to expand the charity, the search is on for a second depot. In Luton, one man attempts to set up his very own food waste charity armed with nothing but a garage, a fridge and a car. And the chairman of the charity makes a special visit to the London depot to reveal whether the organisation has cracked the city. The Big Food Rescue next episode air date provides TVMaze for you. EpisoDate.com is your TV show guide to Countdown The Big Food Rescue Episode Air Dates and to stay in touch with The Big Food Rescue next episode Air Date and your others favorite TV Shows. Add the shows you like to a "Watchlist" and let the site take it from there.